Give the yard a good once-over and get rid of all the dead branches, fallen leaves, and trash that has accumulated over the winter. Put your heavy duty gloves on and pick up anything you see on the lawn and under bushes. You’ve given your rake a good rest over the winter, but it’s time to pull it out again and give your lawn a thorough raking. You’ll want to use it to clear any dead leaves from the grass, as they will keep your lawn from getting some much needed sunshine. Your stack of dead leaves will make a great compost pile, but you can also collect them to be taken away by the city. Raking will help revitalize your grass if it has been laden down with snow and ice over the winter. 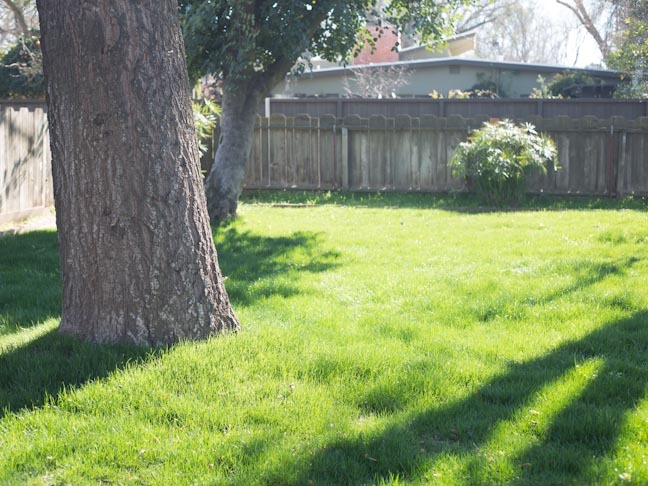 Go over the whole lawn twice in opposite directions to help stimulate growth. Take stock of all your bushes and trees and trim away all dead branches and overgrowth. You want to start the growing season with a fresh landscape, so be vigorous in your pruning. Don’t be afraid to call for the help of a professional if your trees need work in their higher branches. Get out your lawnmower and make sure that it is in good working order. Add gasoline and oil and test it out before starting to mow your lawn. Be sure to check your mowing height so you don’t scalp your lawn. Then give your lawn its first haircut of the year. You’ve probably scaled back your watering schedule over the winter. Now is the time to increase watering back to a normal schedule to help promote healthy lawn growth. Check your local city ordinances for watering days and schedule accordingly. Now you get to spruce up the look of the lawn and garden area a bit with some new growth. Take stock of your yard and see where you can add some new plants and landscaping. Spring is the perfect time for planting, so head to the local nursery and pick out some new bushes and trees to add to your yard. Now that your yard is clean and ready for spring and summer, it’s time to add some elements to make it fun for the whole family. Now is a great time to start a project in the yard so it will be ready for the height of summer fun. Options include a tree swing, outdoor movie theatre, yard games (like Yard Yahtzee and Ladder Golf), and even bigger projects like a tree house or a sand box. What’s going to make your yard fun this year?